By buying this product you can collect up to 275 points. Your cart will total 275 points that can be converted into a voucher of £2.75. Also included in the set will be larger reproductions of the stickers and a large foldout, replica display stand that will hold the "original 12" figures along with the perforated cards attached to the front. 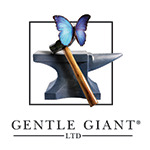 Gentle Giant Ltd's Jumbo line. Just like you remember, ONLY BIGGER! 40 years ago a generation of kids saw a movie that changed their lives. When they left the theater and went to the store to find action figures from their favorite new movie they did not exist. When the holidays rolled around and the kids wanted to find their favorite heroes, villains and droids under the tree, none could be found. The toy makers solution to this problem was "The Star Wars Early Bird Kit." Parents, desperate for anything Star Wars to wrap for their kids, were sold a large cardboard envelope that had a fold out stand, some stickers, trading cards and a promise that WHEN the figures were made, they would be the first kids to receive them. Gentle Giant Ltd pays tribute to that classic Star Wars story 40 years later with the Star Wars JUMBO Early Bird 4-pack. This 4 pack of action figure is a great jumping on point to the Jumbo line for new collectors as well as bringing back some earlier, harder to find figures for current Jumbo connoisseurs. The Early Bird Jumbo figure 4-pack will come in a retro box mimicking the original Early Bird envelope, inside will be the familiar white mailer tray with Luke Skywalker (with his double telescoping lightsaber. The first DT saber in the Jumbo line! ), Princess Leia (with white vinyl cape and blue blaster) Chewbacca (with greenish Early Bird crossbow blaster) and R2-D2 (with clicking head). Also included in the set will be larger reproductions of the stickers and a large foldout, replica display stand that will hold the "original 12" figures along with the perforated cards attached to the front. Gentle Giant Ltd's Jumbo line. Just like you remember, ONLY BIGGER!